Strings stored in StringTables and MessageTables are primarily used as text in message boxes, list boxes, combo boxes, tooltips, and commands displayed in the statusbar. Stingtable strings can also contain control characters and placeholders (e.g., %d, %s). 1. Expand the String folder that's found in the Resource Tree view, and select the stringtable resource to be edited in the Resource Tree. You will see the STRINGTABLE script. 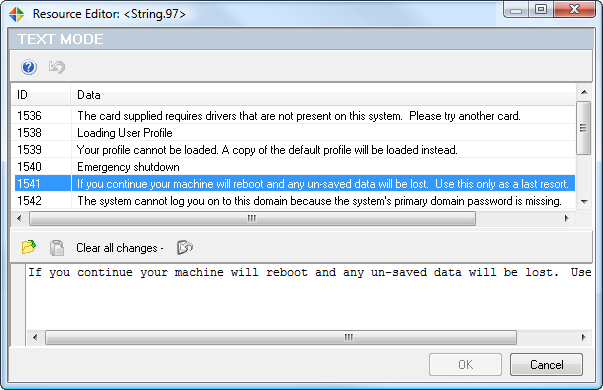 It is important to note that that programs compiled using Delphi may also store its strings in the folder named RCData. See "How to edit Delphi forms"
2. Press the Resource Editor button to edit a selected stringtable. Or simply double-click the resource item directly. 3. Select the string entry from the table and make any desired changes. You can also open a text file to use as a source (Ctrl+O) or paste text from clipboard (Ctrl+V). A missing string or improperly altered placeholder string can cause a modified program to crash at run time. So be careful.